Need a change of scenery? The Sky Factory's Luminous SkyCeiliengs™ and Luminous Virtual Windows™ are photographic illusions of real skies and natural scenery that fit into standard ceiling grid systems and walls. The windows and ceilings use fluorescent or LED lighting that illuminoates the images from behind to trigger relaxation. 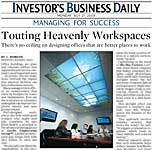 Luminous SkyCeilings are available in large elliptical sections, rectilinear and circular shapes, as well as smaller, personal ceiling sections for individual workstations. They come in a variety of sizes and can be used in both institutional and commercial environments. One special type of ceiling, the MRI Luminous Ceiling, expands the confined atmosphere of the MRI suite in the hospital into a comfortable healing environment. Combining the effects of natural imagery with the therapeutic quality of bright RFfreeLuxTM LED Lighting, the ceiling helps calm patients during the radiological procedure. Virtual Windows transform windowless walls into depictions of natural beauty. they are designed for flush installation, surface mounting, or double facing for viewing from two sides. A unique edge-lighting system allows for a slim design (!3/4 inches thick) with even light distribution, and several styles of wood and aluminum trim elegantly complete the window illusion. The printed image is sandwiched between the diffusion panel in the back and the protective acrylic covering on the front. Edge lighting with either daylight-balanced T-5 fluorescents or RFfreeLux LEDs allows for the unit's shallow depth while maintaining even illumination of the image.